Let's Go Dutch! It's what I always say at the start of each date, just to make sure I'm not stuck with the full bill for a romantic night out at McDonald's. It's also what I've been saying a lot this week as the Dutch baseball team has been playing in the World Baseball Classic. Except, they don't call it baseball. They call it by the much more fun sounding name "Honkbal." While it sounds like it could be a made up game involving geese or bad traffic, according to at least two sources (Alta Vista and Ask Jeeves), Honkbal means baseball. It was brought to the Netherlands in 1911 after some guy saw a game while on vacation in the good old U.S. of A. Ever since then, baseball (Honkbal!) has been...sort of popular in the Netherlands? As you can tell from Bernadina's interview last month they care a lot more about soccer and training glasses and are still confused about how baseball works (So...you're waiting in the outfield...what are you doing during that time?). Despite that, baseball is much more popular in Dutch territories of Aruba and the Dutch Antilles (where The Shark is from). 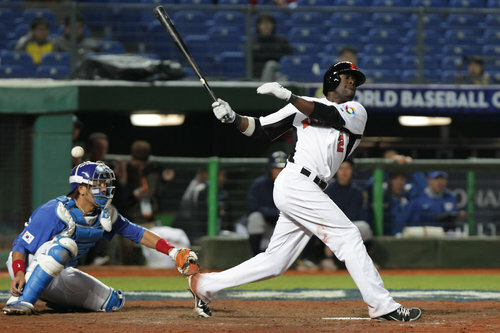 There are a lot of good upcoming players from the Netherlands, (like Jonathan Schoop a player in the Orioles farm system) and they actually won the 2011 Baseball World Cup, even without the Shark's help. 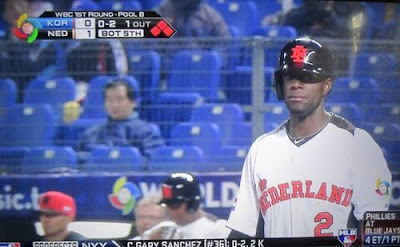 Now the Dutch Honkbalers are trying to defend their world dominance in the World Baseball Classic and have brought along the player with the World's Best Nickname (according to a survey of three of our friends). They already took a bite out of Korea, but were out honked by Chinese Tapei. Australia is the next stop on their quest to make "Honkbal!" a household name. OK, that probably won't happen, but if they beat Australia they can at least move on to the next round. Two years ago today: We use new technology to discover the burning flame of victory inside of The Shark. One year ago today: Tyler discovers someone has photoshopped Bernadina's face over his own and muses on what it would be like to do a Face/Off or Freaky Friday situation with The Shark.